Hyprex 460ml Nano Technology Fire Extinguisher. No other product is more environmentally friendly, simpler to use, faster in speed, safer and more effective in putting out fire than HYPREX. HYPREX is the world's most advanced fire extinguishing technology. It is a cutting edge high performance liquid additive that is neutral in PH value and nontoxic. HYPREX is 100% safe, made from Nano plant extracts, it will not cause any damage or hazard to the Earth environment and Humans. HYPREX's unique rapid cooling technology ensures that fire can be put out within seconds. - Made using only natural plant extracts and other food grade material. 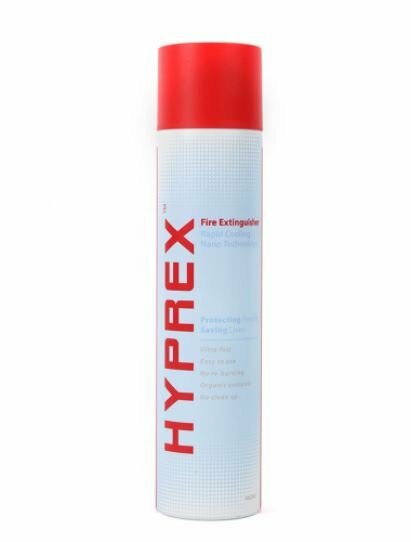 - HYPREX penetrates and rapidly cool burning substrates to eliminate any chance of re-combustion. - No messy clean up, no hazard to humans and plants. - HYPREX actually is a super effective plant fertilizer. Test shows the effectiveness of HYPREX in putting out fire with the early crucial seconds. HYPREX is designed to be a simple , easy to use, no post-cleaning spray. Advanced canning technology ensure safe usage and safe storage in high heat environment. Tested in 100�� environment. Place HYPREX spray strategically in office / home to increase your chances of survival and reduce the risks of losses in the event of a fire.